Medicine ball racks are space-saving solutions for home and professional gyms. Some are vertical trees, while some are horizontal carts. And some come with medicine balls, while others don't. Indeed, there are some different styles of medicine ball racks and holders available if you are the market to purchase one. If you are looking for a portable medicine ball cart with wheels, check out the Champion Sports Storage Cart. If you want a simple vertical medicine ball storage tree without the balls included check out the Medicine Ball Rack by Champion Sports. The CAP Barbell tree holder is another solid racking option that includes the medicine balls. The Body Solid medicine ball rack is yet another interesting option. It is a particularly heavy-duty rack that comes in two different sizes- a 3 medicine ball and a 6 medicine ball size, and also features 360° pivoting ability so that you can optimally place medicine balls on the holder within your home gym. The most dynamic option is the Aeromats Club Rack that features a storage solution for stability balls, medicine balls as well as space to hang things like jump ropes. There are a variety of different styles available, indeed, so take a look through our five favorite medicine ball storage solutions and see which is right for you. 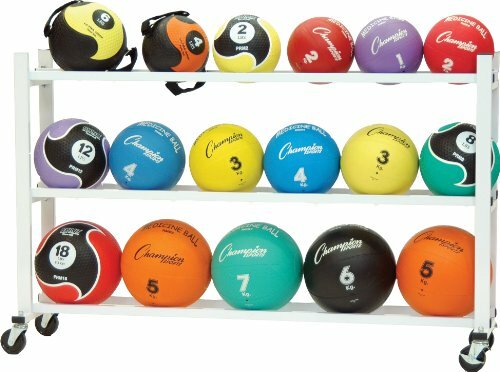 This medicine ball rack offered by Champion Sports is well-made, reliable and practical for anyone who wants to have a convenient storage place for medicine balls or other accessories. Users love the lightweight design and the price, but some do note that the rack scratches easily. This ball rack is made of high-quality steel tubing, and it can hold up to 5 medicine balls, but they are not included in the packaged. This black ball stand has a size of 14″ x 11″ x 52″, and it’s also available in white (22.5″ x 11″ x 52″). Overall, users have a favorable opinion of the Champion Sports ball rack, and they praise its design and usefulness. One buyer comments that it’s very easy to assemble this stand with two wrenches and a screwdriver and that you can’t knock it over. Another customer shares that he uses this medicine ball rack to keep not only his medicine balls, but kettlebells, slammer balls, and other lifting attachments, and he strongly recommends. A reviewer states that the ball rack can hold the weight of several 25 lb medicine balls with no problems and they fit with several inches to spare. 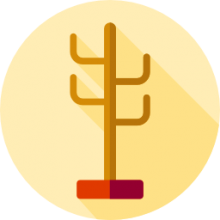 However, some customers have complained that a 14-inch medicine ball won’t easily fit on this tree rack and that some balls fall out. Some also complain that they didn’t receive the correct screws and bolts or that the hardware was missing. This 6-tier medicine ball set offered by CAP Barbell is convenient, practical and well-constructed. Users love the price and the easy assembly process, but some do note that balls are covered in a lubricant which is hard to clean off. With a size of 30″ x 20.47″ x 69.29″, this medicine ball rack is made of heavy-duty, gauge steel and it comes with a set of 6 heavy, bouncing balls with a unique gripping surface for better control. The weight of the balls is as follows: 2, 4, 6, 8, 10 and 12 lbs so this could be an excellent choice if you want to do some workout. In general, users are happy with the CAP Barbell 6-ball rack set, but some do have some remarks regarding the quality of the included balls. One buyer shares that the medicine rack set is well-built, solid, easy to assemble and a great space saver. Another customer mentions that the balls are easy to grip and that their size is perfect for core workouts. The reviewer also states that the rack is slightly larger than he expected, but he can still fit nicely in a corner or put it along the wall. A happy buyer comments that this rubber ball set looks stylish and the quality of the material and the ball is exceptional. However, some customers have complained that the balls deflated quickly or that the set arrived missing a ball. The Aeromats black club stand is well-designed, stable and useful for anyone who regularly trains. Users love that the rack can hold seven medicine balls, but some do note that it’s overpriced. With a size of 37.8″ x 34.6″ x 78.7″, this weighted medicine ball rack has seven layers, one prop stand for tubes, three rings for balance balls, mesh shelves and it’s made in Taiwan. But you should be aware that the package doesn’t include medicine balls, stability balls or tubes, so this won’t be a good choice if you are looking for a medicine ball set with rack. As a whole, customers have a mixed opinion regarding the Aeromats black slam ball rack. A buyer shares that this is one sturdy, reliable medicine ball rack and that it’s the perfect solution for organizing his medicine and slam balls. The reviewer also says that the medicine ball stand fits nicely in a corner and it blends with his interior. Another buyer mentioned that he wasn’t sure if this rack for medicine balls would hold all his gear, but the stand proved to be very effective, and he was very impressed with its quality and functionality. The user also states that he had no problems to put it together and he highly recommends it. However, some customers have complained that the metal bends easily or that it arrived already damaged. Some also complain that the medicine ball rack looks wobbly and inexpensive. If you are wondering how to organize your medicine balls better, you might try the Body Solid medicine ball rack. Users love the sturdy, metal construction and the color, but some do note that the stand arrived scratched. 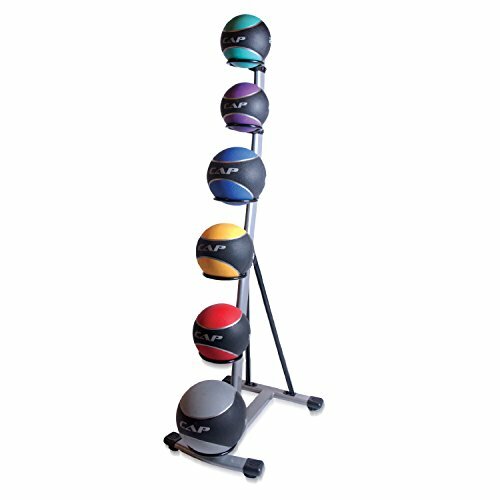 The Body medicine ball rack is available in two sizes – small, which can hold up to three balls (size 26″ x 22″ x 22″) and large – with the capacity to hold up to six balls (size 62″ x 21″ x 23″) and it’s suitable for dual-grip medicine balls also. In general, users have a very favorable opinion of the Body Solid weighted ball rack, and they praise its construction and usefulness. A happy buyer mentions that the medicine ball stand doesn’t take much space at all, and you can just put in the corner. A reviewer also states that the dual grip medicine ball rack makes it easier for him to exercise and his balls don’t get dirty from rolling on the floor. Another customer comments that his fitness gear balls fit with no problem on the rack and that he highly recommends the Body Solid rack. A satisfied user shares that he managed to assemble the stand for less than 15 minutes and that the base of the rack is solid and stable and it won’t wobble or fall off. However, one customer has complained that the rack arrived without all the necessary part and that it was scratched. The deluxe medicine ball storage cart offered by Champion Sports looks convenient, well-designed and suitable if you have a large medicine ball collection that you need to store. Users love that this rack is easy to move around, but some do note that it’s too expensive. With a size of 53 x 9.5 x 35 inches, this ball storage cart is made of 1-inch thick square steel tubing, and it has four heavy-duty swivel casters. You can store up to 20 medicine balls of any size and weight in this portable ball rack, and it could be an excellent choice for a home gym. Overall, users have a mixed opinion in regards to the Champion Sports medicine ball cart. One buyer mentions that he has had this storage cart for some time and it’s holding up pretty well, and he had no problems to fit several different medicine balls in it with room to spare. 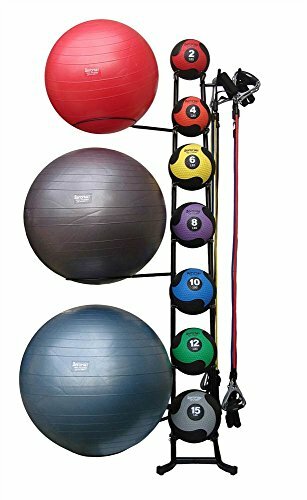 The reviewer also states that this rack for medicine balls is very practical for his fitness room, and he highly recommends it. Another user shares that he is mostly pleased with the Champion ball rack, but he couldn’t fit 20 balls in it. Another unhappy customer states that the storage cart does its job, but the quality is not what he expected, and it’s too expensive. The purchaser shared that the medicine ball cart that he received was scratched and looked used. One interesting option is the Champions Sports medicine ball rack- it is a dedicated rack for medicine balls designed to be a complete storage solution, holding up to five medicine balls at a time. Just be aware that it doesn't actually include medicine balls like the Cap Barbell medicine ball rack set does. That said, it has a variety of positive user reviews from the buyers that we surveyed. One buyer said that it was pretty simple to assemble, using a pair of wrenches and a screwdriver. It also fits Valeo brand medicine balls. Another buyer said that he purchased this medicine ball rack to function as a general gym accessory rack for his home gym in his garage. He, like other buyers, says that in general he only has a couple of medicine balls to store, so he uses the other racks to hold his jump rope, mixed martial arts gear and even a basketball. Some other reviewers that we spoke to said that this was a particularly interesting idea that they hadn't considered- they have a variety of different weightlifting accessories like lifting straps and barbell attachments that it would be convenient to store on this rack. Other reviewers say that the stand is fair at least sturdy, is boy easily knocked over, and it has a fairly small physical footprint, especially considering that it can hold so many different items at once. One buyer that we surveyed was dissatisfied because he found that a 14" medicine ball could not fit into the rack. He has had success storing his yoga gear, including yoga mats, towels and gym shorts, in the medicine ball rack as opposed to the extra large medicine balls he practices with. Champion Sports also manufactures a horizontal medicine ball storage solution that they call a storage cart. This is a mobile option that you can wheel around because of its heavy-duty swiveling 3 inch casters and it can hold up to 20 medicine balls at a time. The reviewers that we surveyed provided some mixed responses, saying that they have had difficulty fitting some medicine balls into this rack, although in general it does get the job done. Another buyer that we interviewed said that in his opinion it was overpriced considering the poor craftsmanship of the cart. One gym instructor says, however, that it is a lifesaver, helping to provide a convenient and portable storage solution for a variety of different-sized medicine balls that he uses in his physical education class. Body Solid produces a ve﻿﻿rtical style medicine ball rack that comes in two different sizing options- one that can store 3 medicine balls at a time another that can store 6 at a time. The manufacturers say that the large version of this rack can hold six regularly size medicine balls that range in weight from 2 to 16 pounds or a can accommodate dual-grip balls that way from 6 to 20 pounds. This particular style of rack can be especially useful for home gyms-particularly if you only use two medicine balls, you would be best served to purchase this space-saving rack as opposed to a larger cart or vertical storage tree. Reviewers that we interviewed said that it is a heavy-duty option that is especially stable and assembled within 20 minutes. As well, it isn't difficult to remove a medicine ball from the rack as you need it, mid-exercise, as opposed to other units that can sometimes make this a hassle. One thing some of the buyers we surveyed disliked is that there was some minor scuffing and chipping that occurs in shipment- so if you receive a model that is in any way damaged make sure that you can return it and replace it with an item that hasn't been impaired during shipment. Other reviewers say that it is a surprisingly heavy-duty option. The metal is really solid and secure, with an attractive appearance, providing a convenient storage solution for loose medicine balls that roll around in home gyms. 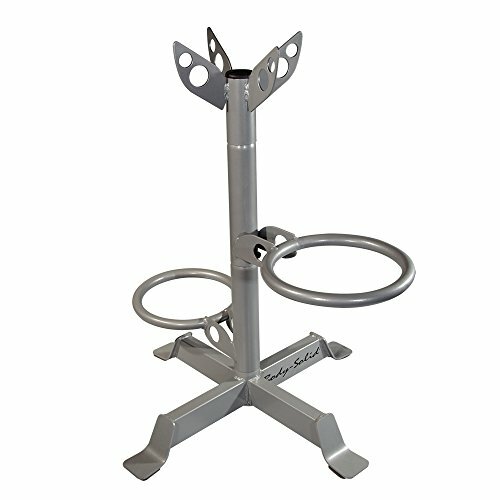 The Aeromats Club Rack was another solid option with a particularly unique design. While it can function as a vertical medicine ball rack, with seven layers to accommodate them, it also has an area for stability balls that can be positioned in three rings that jut out from the vertical column rack. Buyers endorsed this rack for its multipurpose design, saying that it lets you store a range of different elements and gym accessories on it rather than just performing as a medicine ball storage unit. Buyers say that it is reasonably priced considering how much home gym equipment it can store, enabling space-conscious users to load it up with gym equipment that often otherwise gets strewn around home gyms in a messy manner. Many buyers looking for a medicine ball storage solution look to Target, Walmart or even the local Home Depot, but often resort to purchasing online because the prices are so competitive and the selection is better than you can often find in brick-and-mortar retail stores. Before you buy, consider whether you want to purchase a medicine ball rack with wheels, a medicine ball tree rack, or even consider medicine ball rack DIY, in which case you would be looking to assemble your own storage solution.